There’s nothing quite like a Banjo’s Egg Bacon Breakfast Pie. 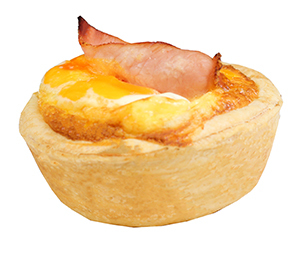 Light and delicious pastry filled with lean bacon and fresh farm eggs and topped with more bacon and tasty cheese – perfect for breakfast or anytime! Pork, egg, wheat flour, vitamin (thiamin), folic acid, water, vegetable oil, salt, emulsifiers (450, 451, 452, 471, 472c, 508), natural flavour, potato starch, stabiliser (1412), sucrose, vegetable gum (407, 415), acid regulator (331, 262), HVP (maize), flavour enhancer (621), antioxidant (304, 306, 316, 320), preservative (250), natural smoke flavour, milk, cultures, rennet, anti-caking agent (tapioca starch, E200, E460), cream, colour (129), sugar, vegetable powders, spices. Other products manufactured on this site contain: Poppy seeds, sesame seeds, peanuts and tree nuts. Therefore traces may be present in this product. 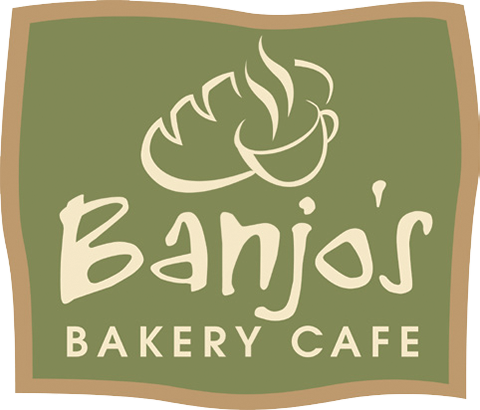 This information is based on specifications provided by suppliers of raw ingredients and based on Banjo’s Corporation Pty Ltd recipes. No warranty is expressed or implied regarding the accuracy or correctness of this information or data contained in the specification. Nutritional data is indicative and provided as a guide only. Vegetarian friendly – Banjo’s Cauliflower & Cheese Pie is a crowd favourite. Sweet cauliflower pieces in a delicious cheese sauce encased in Banjo’s special flaky pastry shell. Try one today – you won’t be disappointed. Other products manufactured on this site contain: Egg, sulphites, sesame seeds, tree nuts and peanuts. Therefore traces may be present in this product. 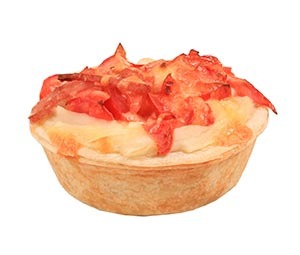 A true winter warmer our country style Potato Pie is a delicious pastry crust filled with hearty beef in gravy and topped with tomato, diced bacon and cheese. Beef, wheat flour, vitamin (thiamin), folic acid, folate, water, vegetable oil, salt, emulsifiers (450, 451, 471, 472c, 508), natural flavour, roast beef flavour (soy), cream, potato, milk solids, preservatives (223, 250), rice flour, pepper, sugar, vegetable powders, flavour enhancer (621, 627, 631, 635), spices, tomato, pork, potato starch, colour (150d), stabiliser (1412), sucrose, vegetable gum (407, 415), acid regulator (331, 262), animal fats, caramel, HVP (maize, soy), antioxidant (304, 320, 316, 306), natural smoke flavour, thickener (1422 maize), wheat starch, maize starch, milk, cultures, rennet, anti-caking agent (tapioca starch, E200, E460, 551). Other products manufactured on this site contain: Egg, poppy seeds, sesame seeds, tree nuts and peanuts. Therefore traces may be present in this product. Warm up those wintery days with one of our hearty Curried Chicken pies. Mild spices combined to create rich warm curry flavours, 100% chicken breast, garden vegetables and encased in our perfect flaky pastry. Wheat, soy, sesame seeds, milk. Other products manufactured on this site contain: Egg, sulphites, poppy seeds, tree nuts and nuts. Therefore traces may be present in this product. 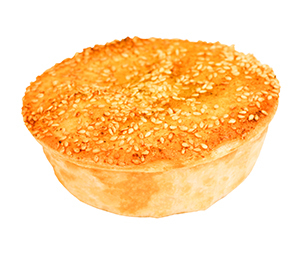 Traditional Aussie Meat Pie ideal for lunch or even watching the footy! Banjo’s authentic flavours and fresh flaky pastry make this traditional pie a true family favourite. 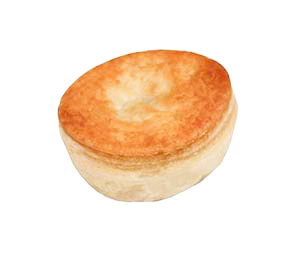 Perfectly satisfying – you can’t get much more Australian than a Banjo’s meat pie! Other products manufactured on this site contain: Poppy seeds, sesame seeds, tree nuts and peanuts. Therefore traces may be present in this product. 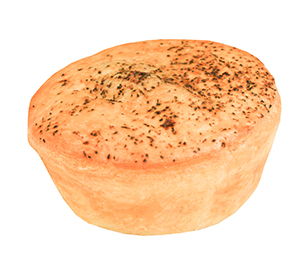 Our delicious Cape Grim Beef Mushroom pie, as the name suggests, contains Tasmania’s superior Cape Grim Beef. 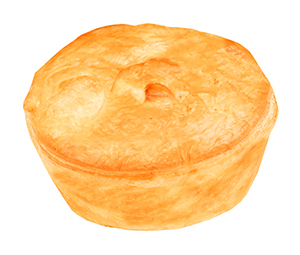 Combined with freshly cooked mushrooms and tasty gravy, our Cape Grim Beef Mushroom Pie is hard to beat. Other products manufactured on this site contain: Egg, milk, sulphites, poppy seeds, sesame seeds, tree nuts, peanuts and soy. Therefore traces may be present in this product. Our delicious Cape Grim Beef Pepper Pie, as the name suggests, contains Tasmania’s superior Cape Grim Beef. 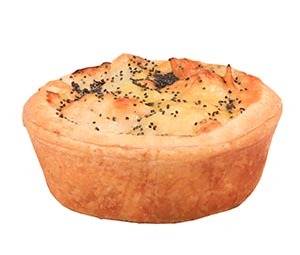 Combined with ground black pepper, spices and tasty gravy, our Cape Grim Beef Pepper Pie is hard to beat. Other products manufactured on this site contain: Egg, milk, sulphites, poppy seeds, sesame seeds, tree nuts and peanuts. Therefore traces may be present in this product. The perfect small savoury treat! Our tempting Party Pies are great when catering for a crowd, afternoon tea or simply treating yourself. Delicious meat in gravy and our perfect flaky pastry – a truly mouth watering combination. 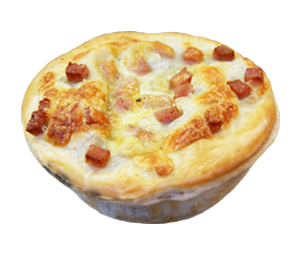 You must experience our Cape Grim Beef, Bacon & Cheese Pie. 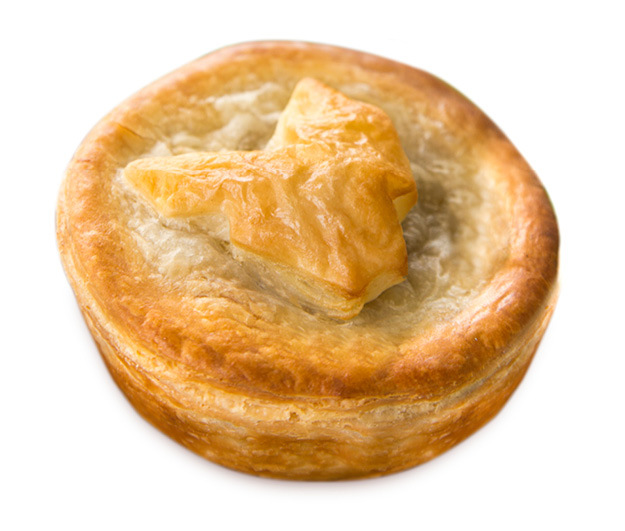 Superior quality Cape Grim Beef combined with bacon, tasty cheese and a delicious gravy all encased in our amazing flaky pastry…ssssshhh! It’s a secret recipe! Once you try it you’ll be coming back for more. Other products manufactured on this site contain: Egg, peanuts, tree nuts, poppy seeds and sesame seeds. Therefore traces may be present in this product. 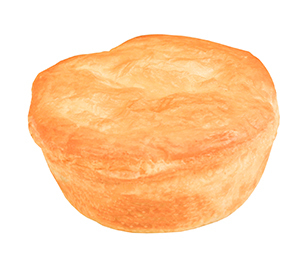 Our Tasmanian Scallop Pie is made with 6 tender Tasmanian Scallops cooked in a mild, traditional, flavoursome curry sauce and encased inside Banjo’s signature flaky pastry pie shell! Tasmanian Scallops, wheat flour, vitamin (thiamin), folic acid, vegetable oil, carrot, peas, beans, corn kernels, water, salt, emulsifiers (471, 472c), antioxidants (307, 304, 320), natural flavour, milk, coriander, turmeric, fennel, pepper, cumin, chilli, fenugreek, garlic, ginger, flavour enhancer (621), sugar, dehydrated chicken meat, vegetable powders, hydrolysed vegetable protein (maize), rendered chicken fat, autolysed yeast, spice extracts [including (100)], anti-caking agent (341), flavouring, maize starch, thickener (1422 from maize), wheat starch. Other products manufactured on this site contain: Tree nuts, peanuts, egg, sulphites, poppy seeds and sesame seeds. Therefore, traces may be present in this product. A delicious light savoury snack – great for entertaining, for kids parties and also great for school lunch boxes. 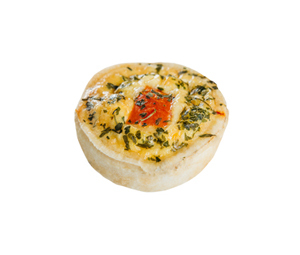 Banjo’s Mini Ham Quiche is a real taste tempter and a firm family favourite. Other products manufactured on this site contain: sulphites, poppy seeds, sesame seeds, tree nuts and peanuts. Therefore traces may be present in this product. 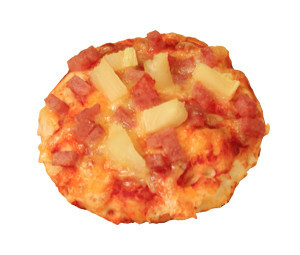 Classic Banjo’s pizza dough crust with a tomato pizza sauce base topped with bacon, pineapple pieces and sprinkled with tasty cheese. Other products manufactured on this site contain: Egg, sulphites, poppy seeds, sesame seeds, tree nuts and peanuts. Therefore traces may be present in this product. 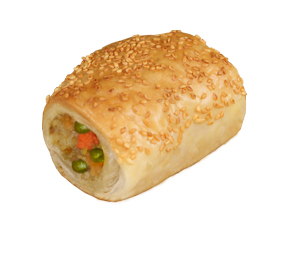 Our Vegetarian Roll contains a delicious vegetable mix wrapped in Banjo’s special golden puff pastry and covered with flavoursome sesame seeds. A tasty savoury, vegetable snack – a vegetarian favourite. 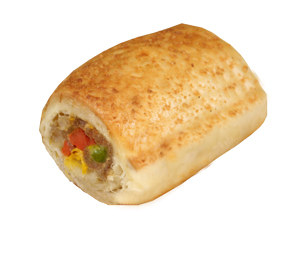 Banjo’s Vegetarian Rolls are Vegan Friendly – ingredients used do not contain animal product. However, the Vegetarian Rolls are baked in an environment used to bake food containing animal matter. Other products manufactured on this site contain: Egg, milk, sulphites, poppy seeds, tree nuts and peanuts. Therefore traces may be present in this product. 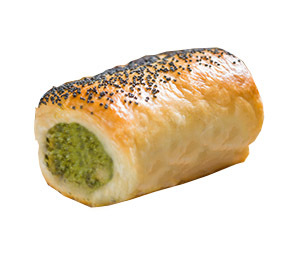 Our Spinach Ricotta Roll contains a delicious blend of shredded spinach and creamy ricotta cheese wrapped in Banjo’s special golden puff pastry and sprinkled with poppy seeds. A tasty savoury, vegetable snack – a great vegetarian option. Other products manufactured on this site contain: Egg, sulphites, poppy seeds, tree nuts and peanuts. Therefore traces may be present in this product. Our divine Sausage Roll is a family favourite – especially popular with the kids! 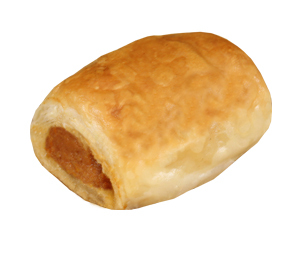 Mouth watering pastry wrapped around our lightly spiced sausage filling … it’s very hard to stop at one. Other products manufactured on this site contain: milk, egg, poppy seeds, sesame seeds, tree nuts and peanuts. Therefore traces may be present in this product. Banjo’s Savoury Rolls are the perfect combination of vegetables and minced beef baked in Banjo’s flaky golden puff pastry. Topped with sprinkled breadcrumbs. Other products manufactured on this site contain: Milk, sesame seeds, egg, sulphites, poppy seeds, tree nuts and peanuts. Therefore traces may be present in this product. An all time American Classic! 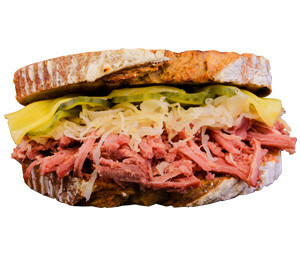 The Cuban Reuben combines shredded pulled corned beef topped with a serving of sauerkraut (pickled cabbage), dill pickles, tasty cheese and dressing creating a memorable meal with every bite. Perfectly sandwiched between 2 thick slices of healthy Sourdough Rye Vienna and served hot from the grill. Make a meal of it! Product is subject to availability. Available from 10.30am daily. Other products manufactured on this site or on external ingredients sites contain: poppy seeds, sesame seeds, tree nuts, peanuts, fish, cereals, crustacea, lupin. Therefore traces may be present in this product. 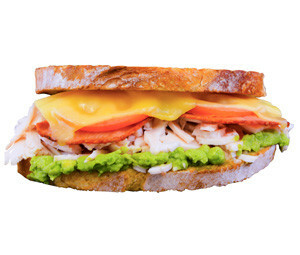 Hot from the grill our delicious Chicken, Bacon and Avocado gourmet grilled sandwich is perfect for lunch or dinner. Served between thickly sliced Artisan White Vienna smeared with smashed Avocado, tender chicken breast, strips of lean bacon, slices of tomato and tasty cheese. 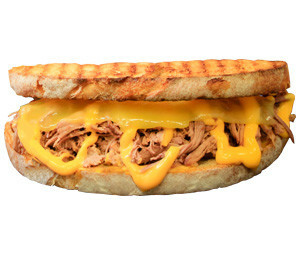 Perfect for lunch on the run or dinner on the go! Other products manufactured on this site or on external ingredients sites contain: sulphites, poppy seeds, sesame seeds, tree nuts, peanuts, fish, cereals, crustacea, lupin, mustard. Therefore traces may be present in this product. A mix of tender beef perfectly flavoured and piled high. Covered with delicious cheeses and sandwiched between thick slices of Banjo’s Artisan White Vienna – served hot from the grill. This hearty snack is a meal in itself, great to satisfy your hunger for lunch or dinner. 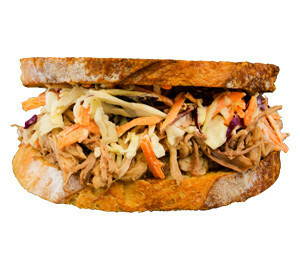 Try our new smoky BBQ flavoured Pulled Pork topped with deliciously crisp coleslaw. Enjoy the fresh crunch of salad with the deliciously satisfying pork pile high sandwiched between thickly sliced Artisan White Vienna. Other products manufactured on this site or on external ingredients sites contain: poppy seeds, sesame seeds, tree nuts, peanuts, fish, cereals, crustacea, lupin products. Therefore traces may be present in this product.